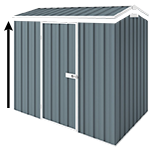 This small size (1.5m x 1.5m) Australian made Durabuilt EasyShed comes with gable roof, which is 1.97m high at the gable and 1.8m high at the walls. This small size (1.5m x 1.5m) Australian made Durabuilt EasyShedcomes with gable roof, which is 1.97m high at the gable and 1.8m high at the walls. It is ideal to store your gardening tools, toys or general equipment. 0.75m wide single hinged door at the front provides you with easy access. If you wish you can change the hinged door to single sliding door below at the accessories section or increase its wall height to 2.1m. You can also add a fibreglass skylight sheet to your garden shed order which replaces one of your roof panels. For more accessories please check out the list below.